Fleetwood Mac’s first North American tour without guitarist Lindsey Buckingham is on track to gross more than $100 million, according to a new report by Billboard. The extensive 2018/2019 series – which opened in Tulsa, OK last October – is expected to sell more than 1 million tickets by the time it wraps up in Calgary, AB on April 15. 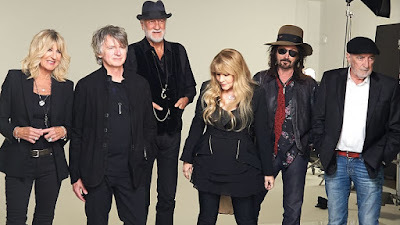 The trek features new lineup additions Mike Campbell of Tom Petty’s band and Neil Finn of Crowded House/Split Enz fame in place of Buckingham, following his firing last year after Stevie Nicks reportedly gave the band an ultimatum that she would leave if he didn’t. Stubner explains the uptick is being fueled by a younger demographic of fans, including teenagers attending the tour with their parents and older millennials enjoying a night out with friends. "They learned about the band from their parents, and then they dug a little deeper," he adds. "There's a hunger for bands with deep catalogs and I see a lot of young people coming to the shows in search of this music they've built a deep connection with. And maybe that's why we have been able to do so well without Lindsey, because it's really about the collective and the show itself. They're coming out for the band." During the tour, Fleetwood Mac released their first-ever career-spanning collection, “50 Years – Don’t Stop”, while Nicks will be inducted into the 2019 Rock And Roll Hall Of Fame by pop star Harry Styles at a March 29 event at New York’s Barclays Center alongside Def Leppard, The Cure, Janet Jackson, Radiohead, Roxy Music and The Zombies.